Provide comfort for the family of John Flynn with a meaningful gesture of sympathy. Passed away on December 16, 2018, age 87 years. Beloved, respected and celebrated by wife Jean (nee Vrubley), daughters Theresa and Patrice (Brad Stein) of Portland, OR, his brightest light, grandchild Kailey Flynn Whitford, his friend since first grade, John Noonan, and so many others. Preceded in death by his parents, Michael and Evelyn Bruders Flynn, he also rejoins brothers Thomas and James. We can only hope heaven is ready. Jack grew up in Milwaukee, attended St Thomas Aquinas grade school, ice skated in Washington Park and played kick the can all along Vine Street with friends and close cousins the Bruders and so many more. He attended Washington, Don Bosco, Boys Tech and finally matriculated from Pius XI High School. He often worked two shifts a day at jobs including Schlitz Brewery until joining the Army in 1951. In Special Forces, he trained at bases throughout the country paratrooping, but one of his fondest memories was being granted leave to watch a Packers/Redskins exposition game at North Carolina. Once honorably discharged, he returned to Milwaukee, working construction and warehouse jobs. A lifelong Democrat, he supported education and the progress of his beloved Milwaukee and Wisconsin. He was a proud, hard-working union man. Jack married Jean in 1965 and was welcomed in as a new sheepshead hand at all Vrubley family gatherings. He supported his daughters’ education and encouraged their independence. Jack worked for Milwaukee County for over 30 years, including the County nursery, Washington Park, Dineen Park and Doyne Park and Golf Course. If you ice skated at Sherman Park, he probably created the seasonal rink. Jack joined Alcoholics Anonymous in 1981, and he found a whole new set of supportive, wonderful people who share their journey of sobriety and living life. His friends at Pass It On provided support and friendship over years. He loved the Packers, Badgers, Bucks and Brewers. He loved children and easily reflected their joy. He loved a great plate of barbecue ribs and he loved frozen custard. And Jack could sniff out a clearance rack bargain like a savant; he constantly shared his loot. He was loved. The family thanks the outstanding professionals who helped us recently through Jack's transitions: St Francis Health Services, Howard Village, and the medical and support staff at St Luke, their Emergency Department, MRICU, and cardiac and pulmonary staff, and amazing Ruth, the chaplain. Thank you to Father Joe Juknialis for sharing the sacrament. Visitation at the funeral home Saturday, December 22 from 11 to 1pm with a service at 1pm. Interment Southern Wisconsin Veteran's Memorial Cemetery Private. In lieu of flowers, donations to Pass it On club (https://mtg.area75.org/meetings.html?dist=29), Milwaukee Public Schools (http://www.mpsfoundation.net/home.htm) or Milwaukee County Parks (https://parkpeoplemke.org/home/donate/) are appreciated to support what he loved most. To send flowers in memory of John P "Jack" Flynn, please visit our Heartfelt Sympathies Store. 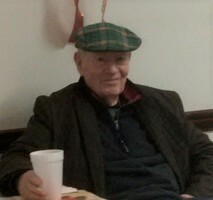 Provide comfort for the family of John P "Jack" Flynn by sending flowers.